This Revelation Timeline Decoded Bible study focuses on the iron-clay feet of the statue in Daniel 2. Summary: Islam and the Muslims represent the clay of the iron clay feet of the statue in Daniel 2. The iron, the Roman Catholic Church, helped Mohammed write the Koran and be revered as the prophet of Islam. The RCC has used Muslims to kill Christians and Jews, to protect Catholics, and to capture Jerusalem. But the Muslims kept Jerusalem for themselves and sought to conquer more land, so they don’t mix well, and they have battled during the Crusades. Hi David. In Daniel 2 41-43 it says mixed and mingled with the seed of men. If it is just about the Arabs, then what about the seed of men, as in seed of mankind? I took it to be mixing with not just the Arabs, but also the seed of men, people’s and other nations of the world before Messiah(the stone) smashes and destroys the feet and sets up his kingdom. But I’m no expert in history, so mYbe there has been an ongoing love hate “partnership” through the centuries that I don’t know about. Your site is awesome, it really opened my eyes. I always felt that we were living in the laodicean age with the church being wealthy, lukewarm and delusional, but I just didn’t know how exactly thr whys and hows because I didn’t understand the historical events of past church ages. So what should and can we do as believers in today’s laodicean church age? Thank you for your comment Peter 🙂 The iron represents the Roman part, the Roman Catholic Church. The clay represents the Muslims. 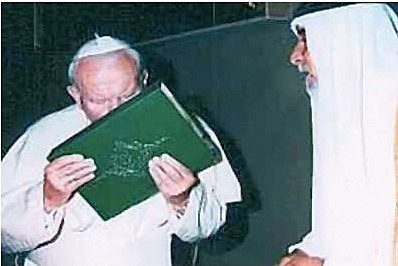 The Roman Catholic Church helped write the Qur’an and prop up the illiterate Mohamed as their leader. They both have killed Jews and the saints. They both have conquered territory once held by the Roman Empire. But they have also battled over territory, especially Jerusalem. I’m blessed to know that the studies have helped you. As for today’s Laodicean Church age, I believe that we should do the same thing as the Protestant Reformers did, proclaim that faith in Messiah’s atoning work is the only way of salvation; and proclaim that the Popes and Jesuit Generals of Rome are the enemy of Messiah and His Church. I would add that we need to teach the truth of prophecy fulfillment, as to expose the deceptions of the enemy, to remove their power. Hello dearest sibling in Christ. As helpful as your studies have been, it is my sincerest concern that many theories contradict Scriptural patterns, history, and even adhere to 7th Day Adventism teaching – a movement which has brought much heresy to the body of Christ. Scripturally speaking, God has often foreshadowed Christ Himself with… Well, men of Christ. Not systems or offices of Christ, but literal men of Christ, in any office or system; chosen and anointed vessels for His will. Offices of Christ were foreshadowed with offices. But the Messiah was foreshadowed with messiahs ( anointed ones ). And the anti-Christ type was present from the OT period, too! Look at Pharoh VS. Moses, Haman VS. Esther, Daniel and his friends vs. Nebuchadnezzar, etc. Even Herod. VS. Christ Himself! God always has a pattern to show off His personality, to authenticate His doings, and to teach us His ways. Any change would simply be unlike Him! The OT is FULL of foreshadows for the NT. So I highly doubt the Pope and his office is the AC… An AC type is more likely. I do agree that we, as Christians, have more responsibility to identify the “many antichrists,” as John put it, though. As for history, it seems that your study is contradicted by the fact that the Ostrogoths came back with a vengeance against the Roman Catholics in the cited dates – and won! Also, FIVE tribes were uprooted, not three. I don’t think God would allow those two mistakes. That would simply be unlike Him. Even when Medo-Persia invaded Babylon, they did so entirely in one night. And lastly… 7th Day Adventism doctrines should be examined for their roots. Much of it is heresy and far from truth. Its father, William Miller, made many mistakes regarding prophecy. As a consequence, Christ lost many people. Please, please test every finding with sources in AND out of the church, church movements and their teachers. Hold them up against the Word and actual historical sources ( I fear many cults and sects have bias ). We must learn to identify our Father’s personality and what our Lord allows or disallows, lest we be led astray. Well Sherry, there are similarities between my explanations and SDA explanations, because they are the only denomination that teaches the historical fulfillment of prophecy. That said, I am not SDA, and some of their prophecy explanations are wrong; including the 2,300 days of Daniel 8, which the Millerites proclaimed foretold that Messiah would return in 1844 A.D., and SDA teachers still get the explanation wrong, saying it started His Investigative Judgment. As for the Pope, this whole website proves that indeed the office of the Papacy is the Little Horn of Daniel 7, the Son of Perdition of 2 Thessalonians 2 and the antichrist beast of Revelation 13. Many witnesses have proclaimed the same thing through the history of the Church, some by people who paid for their testimony with their blood. Many great theologians who wrote before the SDA Church was even created, cited that the Roman Popes caused three kingdoms to be plucked out. I did check historic sources and your post. They disagree with what you have written and asserted here. If history does not agree with prophecy, then we know it pertains to the future. Many scholars have wrongly attributed the edict for the Second Temple to the days of Ezra due to similarities, but closer inspection shows us it happened in Nehemiah’s time instead; the timings were decades, lifetimes apart. Likewise, this could be the case with the assertions made by the SDAs and those who’ve written about the Roman Catholic Church. I merely ask that you research the historical facts again, for they easily disagree with the assertions, unlike, say, the prophecy of Daniel’s 70 weeks – which even liberal historian scholars struggle to refute. And the comments also point out, a major problem with the assertion is, the Roman Empire had two divisions – Western and Byzantine/Eastern. I do think the Pope is a type of AC, however… Yet I struggle to believe that he is the AC when historic, geographic, and most importantly, Scriptural evidences point me to the Middle East more than merely Rome.